Arrive in Izmir. Meet and transfer to hotel. Visit the Church of St. POLICARP which is the oldest church in ancient Smyrna, it symbolized the community of the Seven Churches of the Apocalypse. Then visit Alexander the Great’s “Velvet Castle” overlooking the bay of Izmir. Visit Pergamon, Red Basilica, the Acropolis and the Asclepion. Return to Izmir. Full day visit to the unforgettable remains of Ephesus, the House of Virgin Mary, the Archaeological Museum and the Basilica of Saint John. Return to Izmir. Drive to Sardes, ancient capital of the Lydians and visit the Church of Sardes. 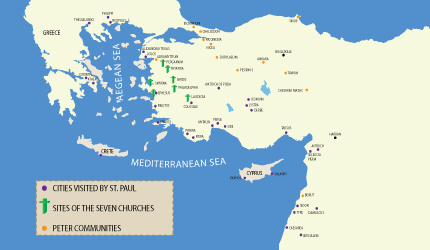 Continue to Alasehir where the ancient Philadelphia Church is located. Walk the streets of Philadelphia, then proceed to Pamukkale, the white “Cotton Castle” with its lime cascades of the Roman spa. See the ancient city of Hierapolis. The Martyrium of St. Philip the Apostle is here. Enjoy a leisurely bath in the hot spring pool of your hotel. Morning visit to Eskihisar, the ancient Laodicea, then drive to Aphrodisias, the city of the Goddess of Love, see the well preserved Stadium, The Temple of Aphrodite, the Odeon, the theater, Agora and Hadrian Bath. Transfer to Izmir airport. End of our services.